When the Fuente family developed the exquisite, silken rosado tobacco leaves on Chateau de la Fuente, they reached for the stars. It was their dream to create the world's finest cigars, and they succeeded with OpusX. The unique combination of Fuente tobaccos produce smooth and bold flavors in complete harmony with the sweet, lingering fullness of the exclusive Fuente Fuente OpusX wrapper tobacco. Experts tasted Fuente Fuente OpusX, which is the original Dominican puro, and proclaimed to the world the Fuente's dream was now reality. 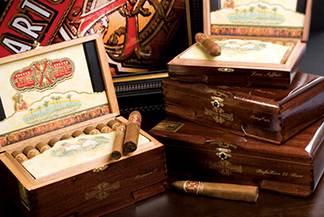 Arturo Fuente receives an unprecedented demand for these extremely rare cigars. However, because it is the Fuente family's deeply rooted tradition to never rush the hands of time, they are only able to create enough Fuente Fuente OpusX® to release these cigars sparingly. Due to the tremendous demand and limited supply, you are more likely to find these rare cigars in our retail store than online. For current availability, please call us toll free at 877-70MILAN (64526) or send an email to customercare@milantobacco.com. Limit Two Cigars Per Customer When Shown As In Stock Below.